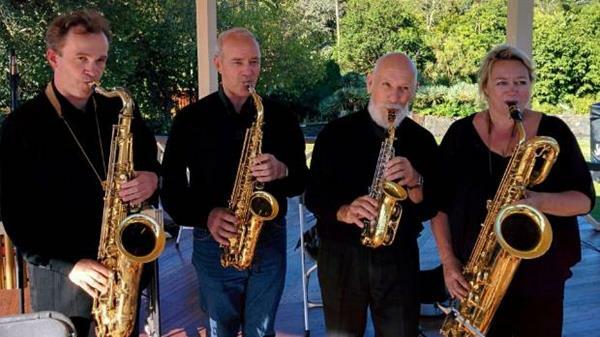 There's lots to do this Queen's Birthday Weekend around the District, including the 4 Day Market in Thames, Nauti Girls Fly In at the Whitianga Airfield, Salmonella Dub at the CoroglenTavern and the Auckland Saxophone Quartet in Thames. Make the most of it, it's the last three-day weekend until October. Also, remember rubbish and recycling collections will be a day later following the Queen's Birthday public holiday on Monday. For the schedule for your area see go to our website. For further information or to purchase tickets see Cosmic Ticketing. The Quartet have a variety filled programme in store for you including works by JS and JC Bach, Lennon and McCartney, Mozart, and Leonard Cohen, New Zealand composers and early classical New Orleans Blues. The dune care group at Cooks Beach needs many willing hands to join them. They have lots of dune grasses and rushes that need to be planted as part of the dune restoration programme. Everyone of all ages and stages is invited to come and join in for a couple of hours to help get the plants in the ground. Bring gloves and spades (small ones are good) and enjoy a morning out on the dunes. 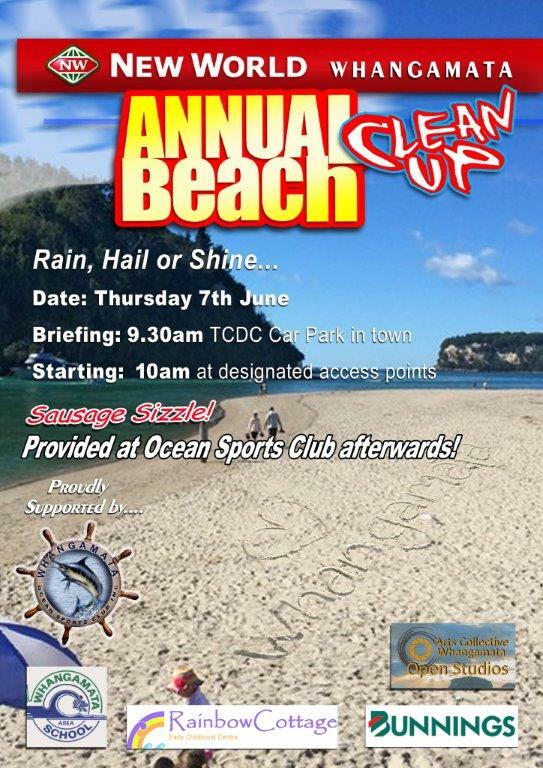 For information go to www.cooksbeachcaregroup.org.nz, or phone 0274 824 110. 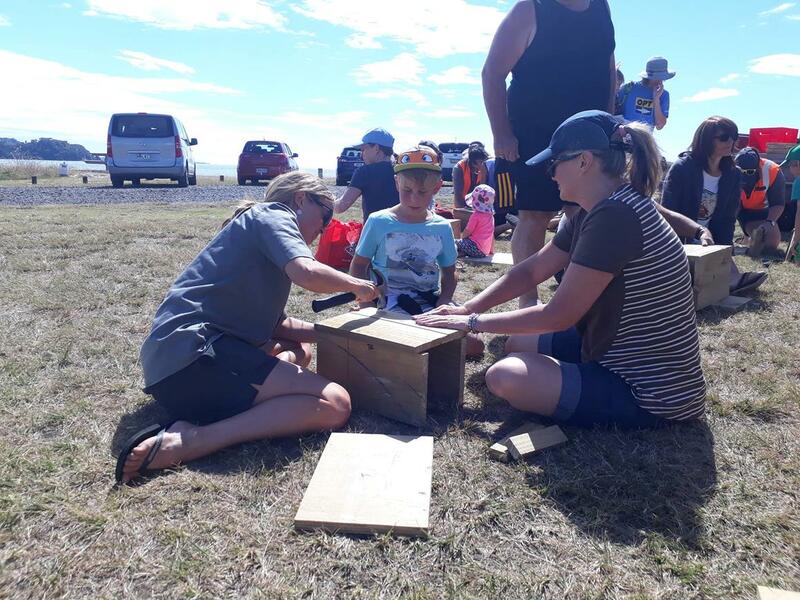 Assist the local DOC rangers at the Whitianga DOC office to prepare materials for their new Predator Free 2050 Pest Police education program that will be delivered to a number of local schools. Tasks include using hand and power tools to cut wood and wire required for kids to build Rat Trap boxes. 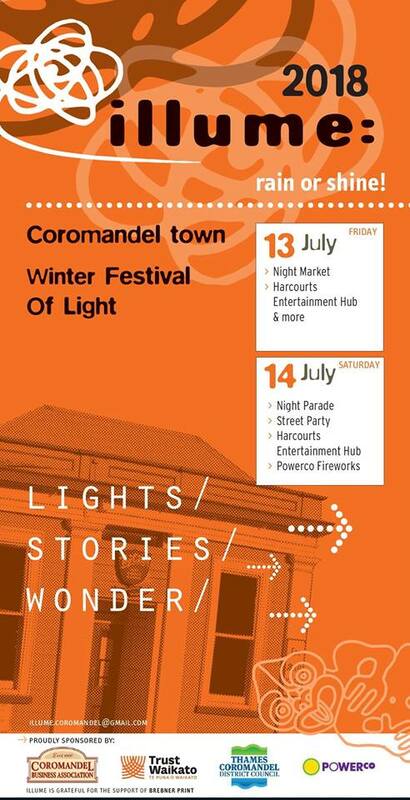 For two nights Illume Festival will be lighting up the main street of Coromandel Town. A free family festival with live music, projections, street performers, lights, food, fun and laughter. For further information on how you can become involved see the illume Festival website. 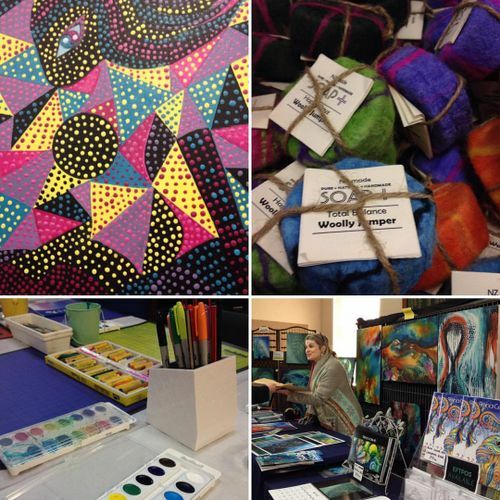 Mercury Bay Art Escape’s annual fair showcases quality handmade arts and crafts produced in the Coromandel Peninsula. 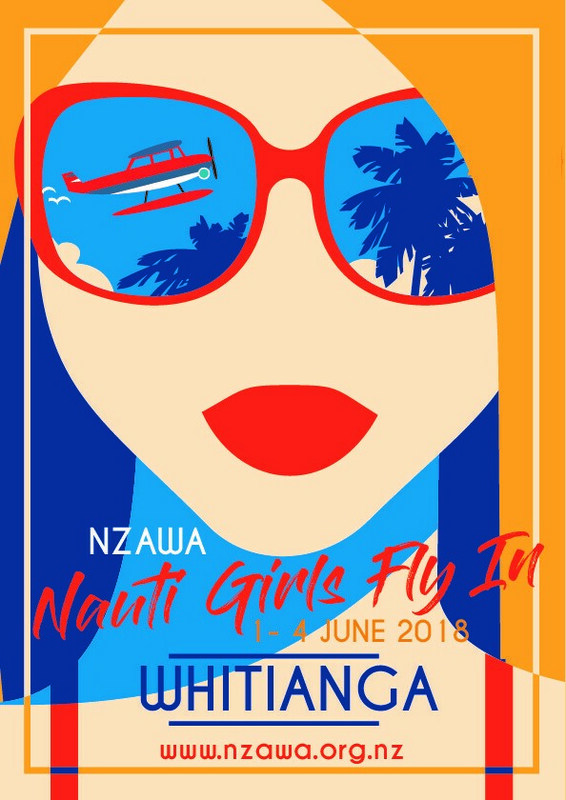 The fair is for one day only and is an excellent opportunity to buy work directly from talented and enthusiastic Coromandel artisans and artists. To make a weekend of it, you may want to arrange visits with local artists while you are here, see http://www.mercurybay-artescape.com/artists for contact details. The Coromandel Peninsula will play host to a round of the 2018 New Zealand Rally Championship on the 18th August, with the organisational team behind Rally New Zealand linking with the Thames-Coromandel District Council to base an event from the seaside township of Whitianga. The rally will be based at the Mercury Bay Sports Multi-Sport Park, which will host Rally HQ and the Service Park. Competition will take place over 135 kilometres of special stage on forestry and public roads around the Mercury Bay and Northern Coromandel regions. For further information on NZ Rally see their website here. Road closure information will be available once confirmed. Whangamata is an adventure paradise with endless beaches, bush and trails to explore. The Whangamata Adventure Race is a great adventure that is challenging but achievable for all levels of experience. All of the races can be done with no support crew making it easy for you to race. 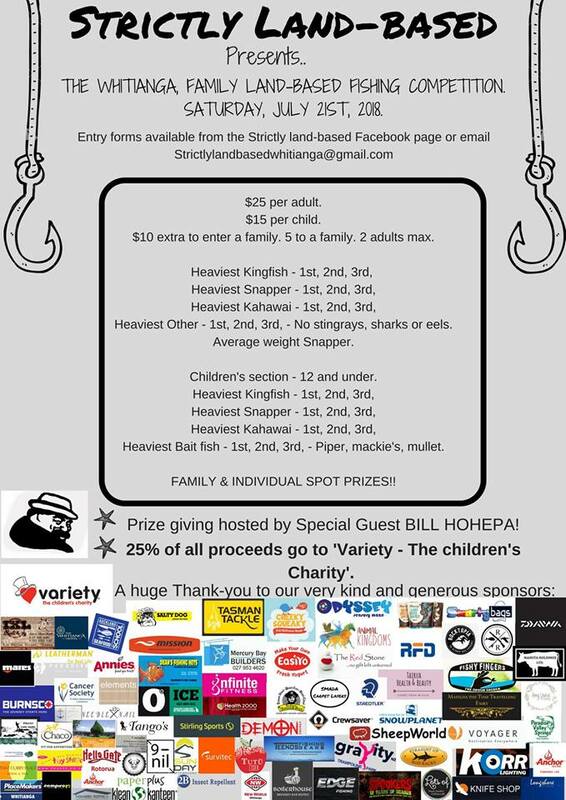 For further informartion and details on how to enter see the Whangamata Events website. Another sizzling hot summer of music will be hitting our shores in January with Greenstone Entertainment announcing its line-up of four international acts for the annual Summer Concert Tour. Greenstone concert club pre-sale ticketsare available from Thursday 17 May 2018. See the Greenstone Entertainment website for further details. 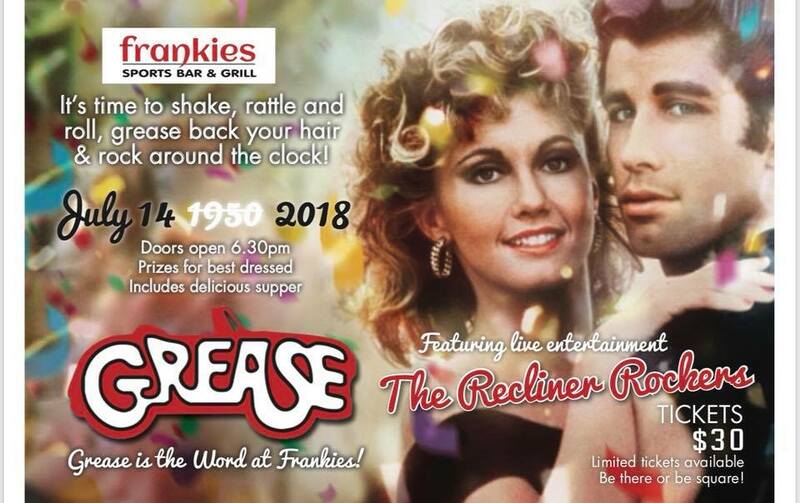 General tickets on sale Monday 28 May 2018 through the Greenstone Entertainment website. 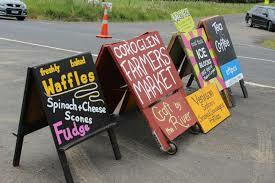 Local manuka honey, home grown community market, baking and much more. Every Saturday 8am-12noon - Pollen Street, Grahamstown. 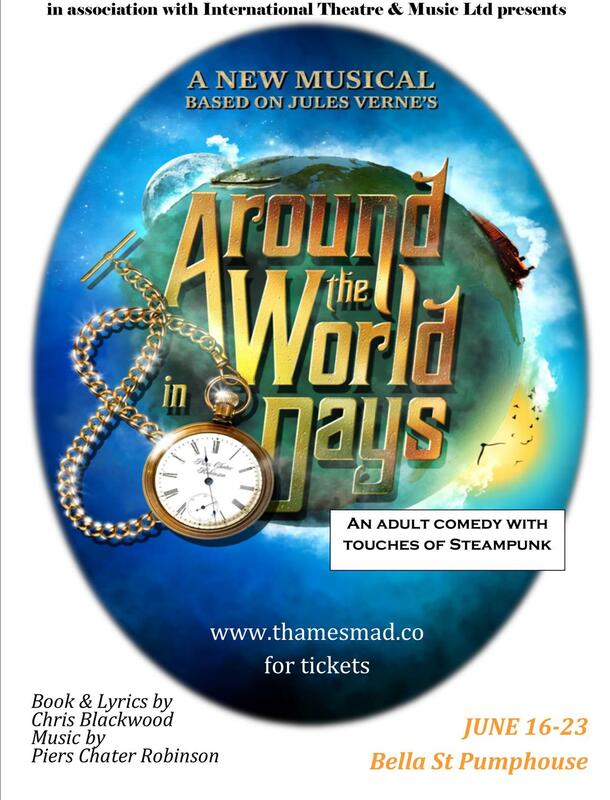 Head down to the Thames Market this weekend. Don't forget to bring your own bag, basket or box to the Thames Market, plastic carry bags are no longer allowed. 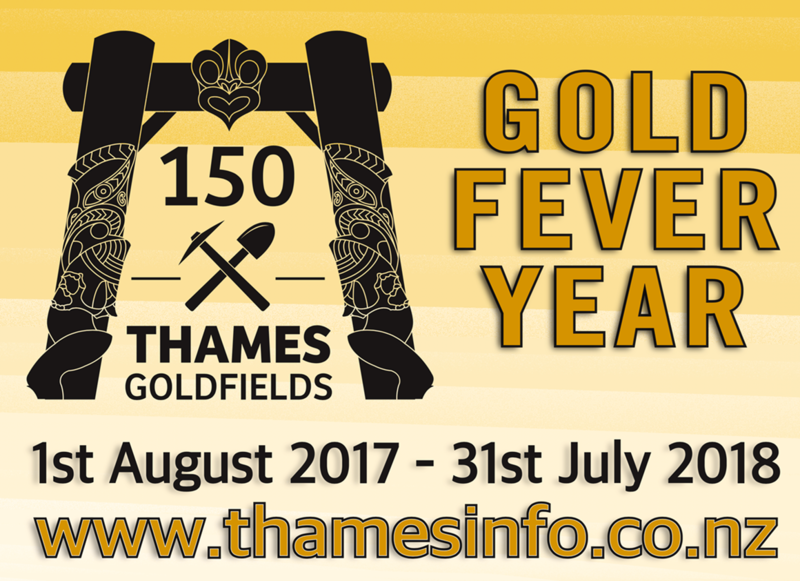 Gold fever year is underway, marking the 150th anniversary of the Thames Goldfields opening. Check the online calendar of events here to see what's on. In 2019, New Zealand will mark 250 years since the first meetings between Māori and Europeans during James Cook and the Endeavour's 1769 voyage to Aotearoa New Zealand. A national commemoration, Tuia – Encounters 250, will acknowledge this pivotal moment in our nation’s history as well as the exceptional feats of Pacific voyagers who reached and settled in Aotearoa many years earlier. For information on how you can be involved see Ministry of Culture and Heritage website or Mercury 250 website. Thames Library Book Club is a relaxed and informal book group. Meet other book lovers and share what you’re reading. Here's the ideal place to pick up some tasty new titles. The Book Club is held in the Thames Library's meeting space, the Carnegie Room, on the first Friday of every month. Mercury Bay Lego Club is free and happens every Tuesday from 3.30pm - 4.30pm at Mercury Bay Library. 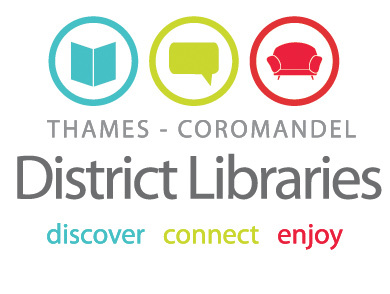 Thames Lego Club is free and happens on the first Wednesday of the month from 3.30pm - 4.30pm at Thames Library. 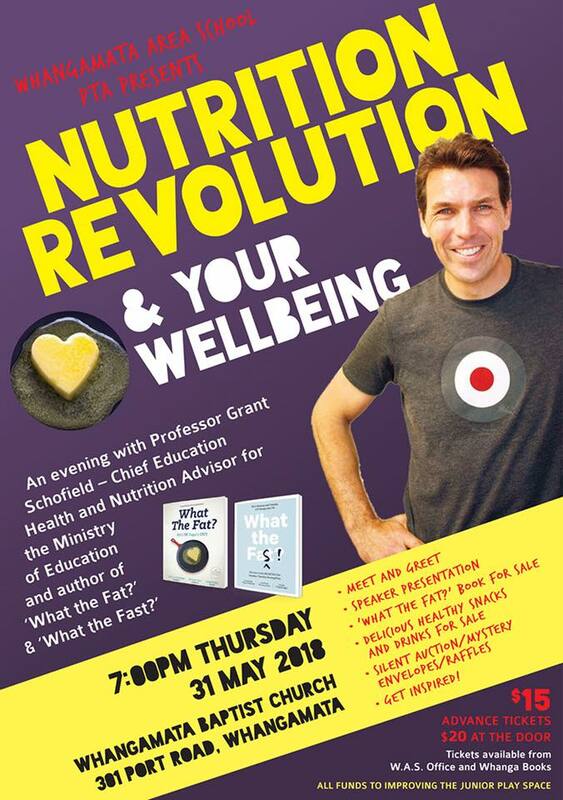 For further information please see the Thames Coromandel District Libraries facebook page.